Awesome plugin! I just have one suggestion/request. Could you add place up the top of the config that allows you to disable features? Make so you can disable all, and have all enabled to start off with (to help other people) I just need to disable the TempBan and Ban section, could you please do that? Thats because the plugin is not connected to a mysql database as you have it setup for. I noticed this the other day as we were changing our mysql passwords and I misspelled the password, and did a /warn to test if it was connecting to the network. I cannot warn players on my server. Whenever I use the command /warn DeJay6424 test I get told "/warn <player> [reason]"
Is it possible, with the config.yml to put a default prefix when we use mysql ? For example, when the mysql is created, i would like to see "mb_players, mb_bans..."
Every time I try to tempban someone, they will only get banned for 10 minutes and 5 seconds..
Can't find anywhere in config to change this? HELP! Is there a command to look at all the banned players? 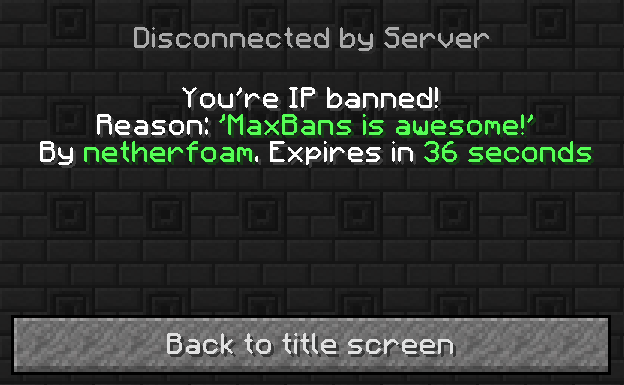 Tempban works fine on MaxBans 2.3, use this. Please add a command listing how long a player has been playing on the sever in total. MaxBans v2.3 work with spigot 1.8.3 ?? And how can i set tempmute/ban limit only for my moderators (but not for administrators) ?? And why mute timer is not disabled when player offline ?? It's stupid! You will fix the error with /tempban? I haven't been developing MaxBans, just 'managing' it for JOEHOT, who couldnt seem to find time to actually finish the 1.8 update of the plugin. An update might be out soon though.